This is our introductory page on South Africa, but it's important to note from the start that Expert Africa doesn't offer trips to the whole of South Africa. Instead, we concentrate only on what we know best: South Africa's Cape. Outside of the Cape, the only places that you'll find on our website are a few hotels in Johannesburg that we use as stopovers, included here because our travellers often need to spend a night near the airport, to catch connecting flights. 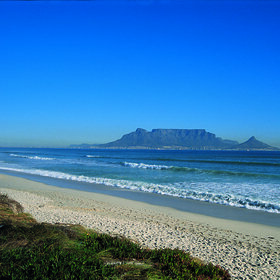 With a family run guest house or luxury hotel around every corner, the Cape of South Africa probably has a greater range of accommodation for holidays than anywhere else in Africa. Consequently, we don't try to cover everything; we are very selective. We have hand-picked a range of excellent hotels and small guesthouses that we know from experience, and are totally confident in recommending them for holidays with comfort, value – and often luxury. With these we've included some interesting safari lodges, on the east side of the Cape north of Port Elizabeth. These can't offer a safari experience to compete with those in Botswana, Namibia or further north. We never pretend that they do. However, you can do a very comfortable introductory safari in these and, being malaria-free, are a great favourite for family safaris. Self-drive holidays between Namibia and the Cape There's an endless choice of options for fairly adventurous trips with start in Cape Town and end in Windhoek, or vice versa. You can fly into one, collect your hire car, and leave from the other – the choice is entirely yours. Give that the Namibia's Fish River Canyon, and the northern Cape's Kgalagadi Transfrontier Park are both between the two … a long self-drive can make a lot of sense. Allow about 3 weeks for such a trip – and expect to be amazed by the change in scenery as your drive from one to the other! Botswana safaris and Cape Town It's very easy to combine a safari in Botswana with a few days in Cape Town, or even longer in the Cape. Generally the flight work best if you visit Botswana first – as this usually avoid the need to over-night in Johannesburg in the middle of your trip. Holidays to the Cape and Mozambique beaches These might not seem an obvious combination, but a trip to the Cape – when the weather's not quite hot enough for lying on its beaches, can combine quite well with a stay on a tropical island beach – like those in the Bazaruto Archipelago.